45's, but not for playing records you treasure. before to meet the same standard. to find features like semi and fully sutomatic tonearms. Why your last 'table should be a KAB modded 1200! The SL-QD35 is a fully automatic direct drive. This model starts and returns automatically. Features Technics coreless brushless quartz locked direct drive motor technology. Has a auto repeat function.Tonearm is all metal and features Technics hi quality gimbal bearings. Fully restored by us. Table will be supplied with a good condition stock dust cover or a vinyl cover. Includes Audio Technica cartridge with new stylus and audio cables. 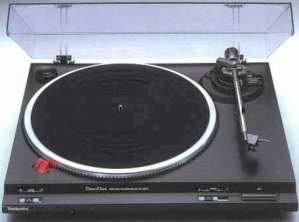 If you are looking for a fully automatic turntable, this SL-QD35 could be worth your consideration. Like all KAB refurbished Technics, the table will be professionaly packed and double boxed using all new boxes. Pictures above are from catalogs. The SL-DD22 is a semi automatic direct drive. This model returns automatically. Features Technics coreless brushless quartz locked direct drive motor technology. Tonearm is all metal and features Technics hi quality gimbal bearings. Fully restored by us. Table will be supplied with a good condition stock dust cover or a vinyl cover. Includes AT Cartridge with new stylus and audio cables. Pictures above are from catalogs. Do I really need 78 RPM speed? This is probably the last turntable you will buy. It is not however, the end of your record playing days! Your hobby interests could easily take you into an area where you will need to be able to play historic material. This is why many of our record players include this speed. What is the purpose of variable speed? Variable speed is useful for modifying pitch, or to bring an older record into conformance with a known musical key. Many 78's made before 1926 benefit greatly from this feature. Are different needles required for LP, 45's and 78's? Yes. There are two basic groove sizes, 78's are called Standard groove and LP's & 45's are called Micro groove. There is a 4 to 1 difference in stylus size for each groove. It stands to reason that the right size stylus gets the best sound from each groove. What about big 16" diameter transcription recordings? Before 1948, these were popular for broadcasting radio programs. Finding a turntable to play them can be difficult. Will your turntables connect to my computer's sound card? Maybe. The signal to your sound card must be pre amplified first. If the turntable has a built in preamp then yes, it will directly connect to your sound card. If it does not have a preamp, an outboard preamp would be required. You will probably need special cables too, so consult your sound card manual. Will your turntables work with my new stereo? Maybe. Look to see if you have a phono input on your new stereo. Many companies have decided to leave out this input thinking that no one plays records anymore! If your new stereo does not have a phono input, you can either choose a turntable with a built in preamp, or purchase an outboard phono preamp separately. You would then use the AUX input on your new stereo. Are cartridges and styli supplied with all your turntables? In most cases, yes. The product descriptions will clearly state whether or not cartridges are supplied. Is turntable set up difficult? This varies with the model. But basically, the SL-BD20, 22 and 78 are our easiest models since there are no tonearm adjustments. On the other models, the tonearm is the only critical area. You will need to balance the arm and then set the tracking force. Instructions show exactly how to do this and you can always call us for assistance. It's really quite easy to do. Some models are available with export voltages. Prices may be higher for these. Please contact us for more info. Record Player: Generic term for a record player. Variable Speed: Player speed can be adjusted. Good for matching beat or key signature. T4P : A fixed tonearm design requireing no adjustments for proper operation. Turntable: A manual record player. You start the record and cue the needle at the end of the record. Semi Automatic: You start the record but the tonearm cues and returns automatically at the end of the record. Fully Automatic: Record begins playing at the touch of a button and shuts off automatically. Record Changer: This is a fully automatic record player that also lets you take a stack of records and play them in succession. Phonograph: This is a fully self contained record player with its own speakers and controls. A Basic Primer On Setting Up A Turntable and Tonearm. The Control Bar which features the Subject and click on points for Page Index, Frequently Asked Questions, Additional Subject Information and the Help page your viewing now. Use the Control Bar to navigate quickly to a section. Click BuyNow to add an item to the shopping cart. On the cart page you will be able to change quantitiy or delete items. There is also a ship cost calculator on the cart page.